Fastener threads are a ridge of uniform sections in the form of a helix on the internal or external surface of a cylinder and are also described as a sloping plane curled around a cylinder. Internal parallel threads are on the inside of nuts or holes and they are designed to mate together with external threads. Threads are produced from the measurement of the outside diameter of the shank called the ‘nominal diameter’, and refer to the diameter of the plain bar from which the threads will be rolled. The maximum external diameter or thread crest diameter of an external thread is called the ‘major diameter’ It can be measured on the crests with a calliper or micrometre. Due to the thread tolerance, the major diameter of any thread is slightly less than the nominal diameter. The thread root diameter at the bottom of the threads is called the ‘minor diameter’ the bottom of the thread is called a ‘thread root’. The effective diameter is halfway between the major and minor diameter; it measures halfway up the helix crest. This is the diameter at which the external thread should contact with the internal thread because of this it is an important dimension. For internal threads, the thread crest is the minor diameter because it is the smallest dimension. The thread root diameter is the major diameter. 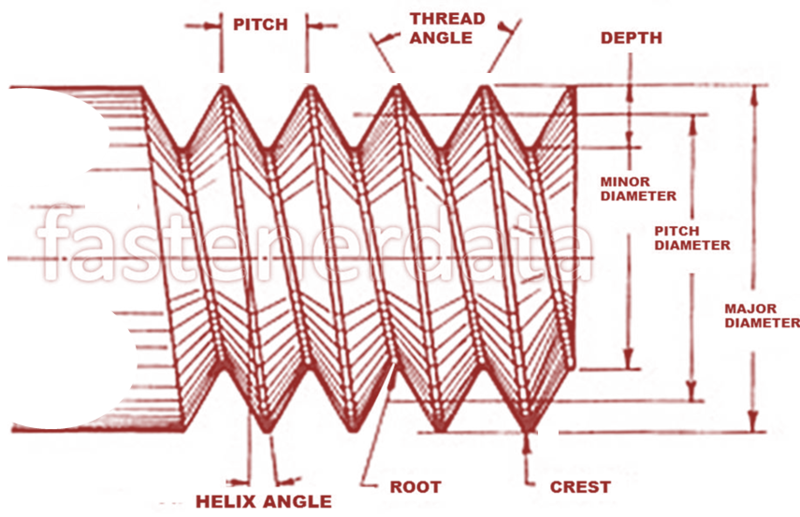 Thread pitch diameter is the same definition for both internal and external threads. Thread pitch is the distance between threads and is a measure of the coarseness or fineness of threads. There are two systems of measurement’ the pitch of metric threads is determined by the distance between thread crests, so it is typically measured in millimetres. Inch threads are measured as threads per inch, so it is a ratio, usually kept as a whole number. The flank is the angle at which the helix is raised to form a crest on the thread. The crest of a thread is the height at which an external thread is raised or the depth at which an internal thread is indented. For common applications, screws and bolts are measured at the crests, while nuts are measured at the roots. The lead thread is the point at which the thread groove is visible on the point of the screw and the point of entry into the threaded hole. The threaded portion is the total section of the screw on which there is a thread and is a measurement of length. Thread run out is the point at which the thread and the plain shank meet and goes from full thread to no thread. There are two important angle measurements of threads. The ‘thread angle’ is the angle between the ‘thread flanks’, the two straight surfaces from root to crest. In other words, it is the angle of the ‘V’ of the thread form. Fastener standardisation and the market movement to the metric system have reduced the different number of thread forms around the world. The ISO metric thread series is the most widely used system, manufacturers in all parts of the world make fasteners with metric threads complying with the ISO standards. On new designs, most designers specify ISO metric threads and fasteners with these threads are readily available around the world. The exceptions to metric threads will continue to exist but reduce through obsolescence; American Inch is still dominant in the USA and with USA manufacturers around the world. British machinery yet has a hold historically around what were the British colonies, but again will reduce through obsolescence. The aerospace industry worldwide has only partially converted to a metric system, and inch sizes are still specified in fasteners for commercial aircraft and engines. The most commonly used inch thread for aircraft applications is the American Unified fine pitch (UNF) system with a large root radius for increased fatigue properties, designated ‘J’, hence UNJF threads. Where metric threads are specified, they are usually ‘MJ’, again with large root radius. Thread angles in metric series threads are 60⁰ and all dimensions are in millimetres. Thread angles in the Unified series are the same as metric at 60⁰ In the USA and Canada, most fasteners are still specified in inches, to the unified system, either UNC or UNF, for coarse or fine threads. Thread angles in the British series are 55⁰; the UK has separate historic thread standards, which although they are rarely specified in original designs, still have some residual applications, so there are still requirements for such fasteners mostly for service and repair. These are the BSF and BSW inch systems (British Standard Fine and British Standard Whitworth) that use a 55˚ thread angle. There is also the rarely used BA (British Association) system for small metric screw sizes, using a 47.5˚ angle. As the descriptive size gets bigger the screws become smaller. For example, 2BA is larger than 8BA. The normal choice of ISO metric thread is usually coarse, and unless a fine pitch is shown in the thread designation, the coarse pitch can usually be assumed. This is true of inch thread systems, for the same reasons. Fine pitch threads are more difficult to assemble because they have tighter thread fit; small amounts of raised metal on the thread crest can interfere with assembly into an internal thread and minor damage to the mating thread can cause the fastener assembly to lock. Fine threads will allow higher clamp loads than the equivalent coarse threads, accordingly, they are often used in situations where fatigue life is important, such as connecting rod bolts and aerospace applications. Fine threads also have better resistance to vibration loosening, because of the smaller thread helix angle. Coarse threads have more open thread fits and a faster screw down speeds can be used in assembly. They also have greater resistance to thread stripping; they are the first choice for general purpose assemblies. UNC, UNF, BSW and BSF, the pitch is expressed in numbers of threads per inch, 1/4 -20 UNC, 20 Threads Per Inch or 20 TPI. In many instances, the TPI is missed and the products will be shown as 1/4 UNC or UNF and the British threads as 1/4 BSW or BSF. Metric and BA threads, the pitch is a single thread measured and expressed in millimetres. M10 x 1.5; this means 1.5 mm from the same point on two adjacent threads crest tops.